Whether or not your downstrokes are decent. Lettering is a trend that’s been inescapable for years now, and I’m not mad about it. Every time I see a random phrase made beautiful with this craft, I get a serious case of art-envy. 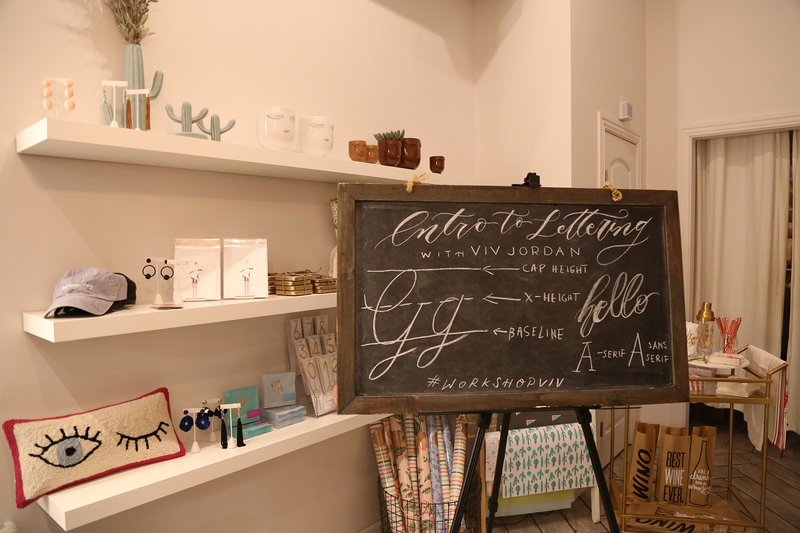 A YouTube tutorial can only teach you so much, so when an opportunity to take an introductory class from local lettering guru Viv Jordan, I was interested. Then I learned that the workshop would take place at All Good Things Paper, a bright new boutique in the Bishop Arts District, and I was sold. I’ve always fancied myself a creative (in the curating-a-Spotify-playlist-or-an-Instagram-feed sort of way), so I was hopeful that I would walk out of Jordan’s two-hour less ton with somewhat of a grasp on the skill. Spoiler alert: I didn’t, but that didn’t matter. 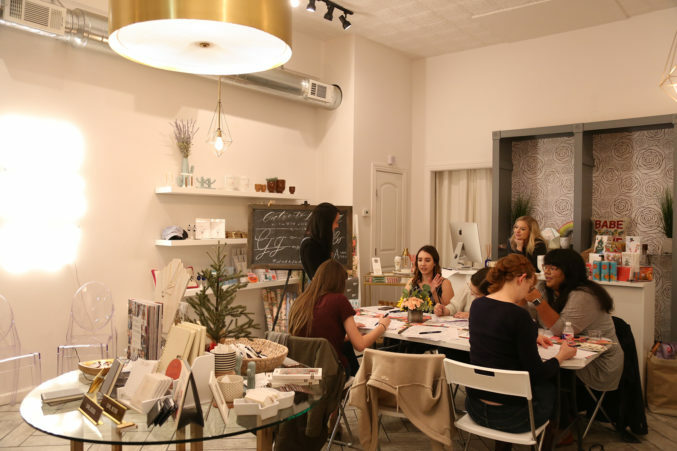 Packed with carefully curated gifts and a light sprinkling of holiday decor, All Good Things offered a warm welcoming on the Wednesday night of class. Then I met Jordan, whose bubbly hug dashed any suspected notion of a stuffy, formal class setting. 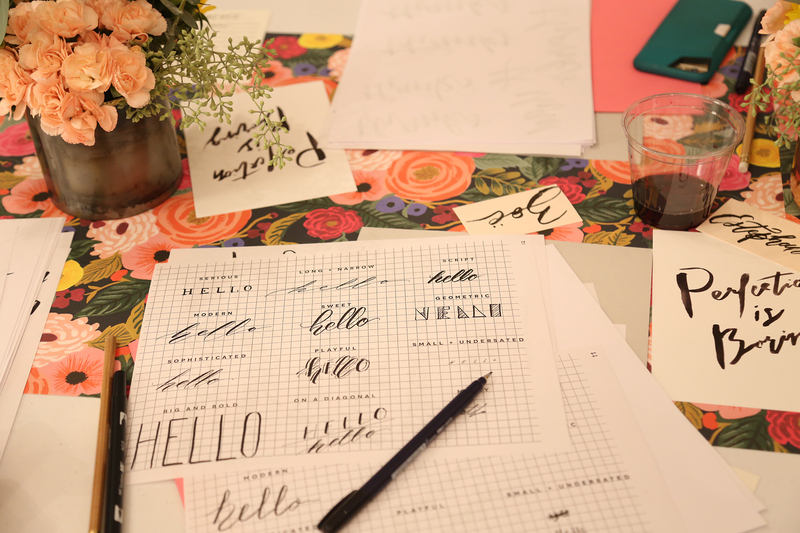 The intimate class consisted of five other students with varying degrees of lettering expertise. Each place setting included a hand-lettered name card, two pens, and a handful of lettering worksheets featuring quotes from the movie La La Land. We began the workshop with introductions and a practice worksheet, filling an entire page with variations of upstrokes and downstrokes in an attempt to get a feel for the pen. This exercise was, without a doubt, my best work of the night. Once we moved on to drawing actual letters, I knew I wasn’t going to get a gold star on my final product, but Jordan, a former elementary school art teacher, had nothing but kind words for everyone in attendance. 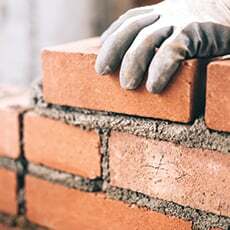 She complimented my progression, and something about her just made me believe her. Perhaps it was her six years of experience as a teacher, but Jordan held our rapt attention, never letting a silence seem awkward or a moment feel dull. She walked through each step slowly and carefully, making sure we felt heard when we had questions along the way. She showed us different ways to draw the same word multiple times, reassuring us that perfection should never be the goal. I strongly suspect all of her workshops feel more like a social event than a class. I wasn’t the least bit surprised when she told us she’d recently held a workshop at a bachelorette party. “For me, these workshops are all about the people; the relationships,” she says. As the wine flowed, we talked about everything from boyfriends to bucket-list dreams, and none of it felt forced. The class was slated to end at nine, but the first person to leave (full disclosure, it was me) didn’t walk out until around 10 pm. I won’t be launching my own line of hand-lettered greeting cards any time soon, but you might catch me practicing with my new Tombow Fudenosuke hard nib pen (see, I’m getting it). And that’s a start. To catch Viv’s next wine-fueled workshop, check her website for upcoming events at local stores.